The Côte Bleue (Blue Coast) is the part of the Mediterranean coast located in the west of Marseille, to the mouth of the Etang de Berre. It is a very pleasant destination in an environment still well preserved. 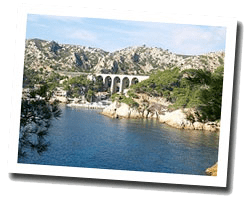 At the seaside you can find calanques and beaches with stunning views of Marseille. The marine natural park is home to protected species. 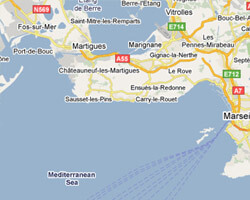 On the Côte Bleue enjoy a seaview holiday rental. 2 rooms Apartment 21 m2 in a residence Le Tikao. Terrace. Shared outdoor swimming pool. View of the sea. 1 Bedroom(s), 1 double bed(s). short stays possibility. Final cleaning : inc €. Studio Apartment 42 m2 in the "Rives d'Or residence". Balcony. View of the sea. southfacing house, comfortable, nice amenities, with garden and panoramic view of the Mediterranean, 250 m from the sea in a dead end with private parking. Located 1 km from the village and its charming port. Carro : 3 rooms house, one floor 53sq. m 50 m from the beach with sea view of "Côte Bleue". Loggia, Terrace with outdoor furniture, deck chairs and barbecue. railway station : 20 mn walking. 1 Bedroom(s), 1 double bed(s). Final cleaning : 50 €. 3 rooms House 70 m2. Terrace with barbecue. Nice view of the sea and the rocky coast. 2 Bedroom(s), 2 double bed(s). short stays possibility. Final cleaning : 60 €. 100 m from the beach, apartment with a 19-m² terrace, sea view, and no direct neighbours.